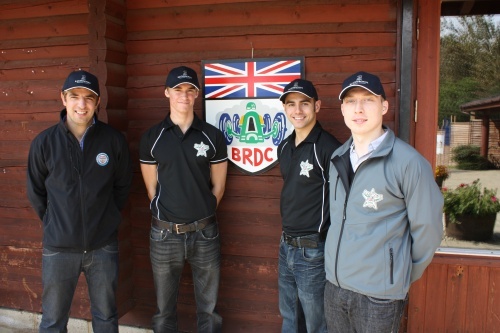 BRDC SuperStars, Adam Christodoulou, Dean Smith and Oli Webb along with BRDC Rising Star Joe Osborne, joined BRDC Members on the annual Clay Pigeon Shoot at the E.J.Churchill Shooting Ground near High Wycombe. It was a great day for all involved and another learning curve for all of the drivers taking part. Oli Webb was the only participant to have been on a shoot prior to the event but it didn’t deter any of them, they all relished the experience and of course the competition. BRDC SuperStar Adam Christodoulou “It was my first shoot and I really enjoyed it. I can see the association with racing as you have to be very precise. I will definitely do it again”. The shoot, which took place amidst 40 acres of stunning woodland in the heart of the rolling Chilterns, consisted of two sessions over six disciplines. The SuperStars and Rising Star were challenging themselves from the off but it was Dean Smith that came out on top wining the Novice category. BRDC SuperStar Dean Smith “It was a great day. I had never shot before so it was completely new for me. The first shoot was so weird but I got used to the gun and just had fun”. It was a collective “what a fantastic day” from everyone and “when is the next one”….BRDC SuperStar Oli Webb “I had only been on a couple of shoots before so was pretty much a novice but the day was brilliant and of course we had some great weather which always helps”.